A Selection of freshly baked homemade scones with fresh cream served with Homemade Jam, Homemade Cakes and Finger Sandwiches with Luxury Fillings and Unlimited Tea & Coffee. 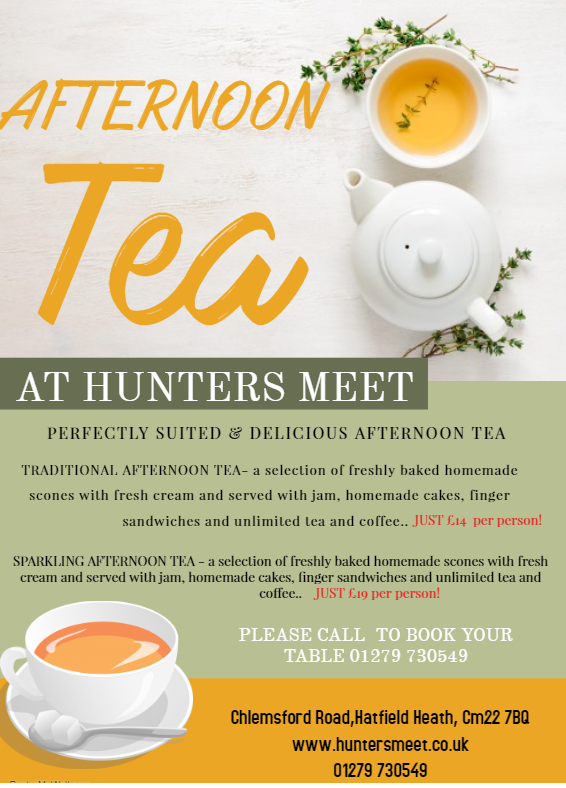 A Selection of freshly baked homemade scones with fresh cream served with Homemade Jam, Homemade Cakes and Finger Sandwiches with Luxury Fillings and Unlimited Tea & Coffee and a Glass of Bubbly. Previous Post 15% OFF YOUR WEDDING ON LAST AVAILABLE 2019 DATES Next Post Benidorm comes to Hunters Meet on 26th April .